Amlodipine is a calcium channel blocking agent that selectively blocks calcium ion reflux across cell membranes of cardiac and vascular smooth muscle without changing serum calcium concentrations. It predominantly acts on the peripheral circulation, decreasing peripheral vascular resistance, and increases cardiac output. 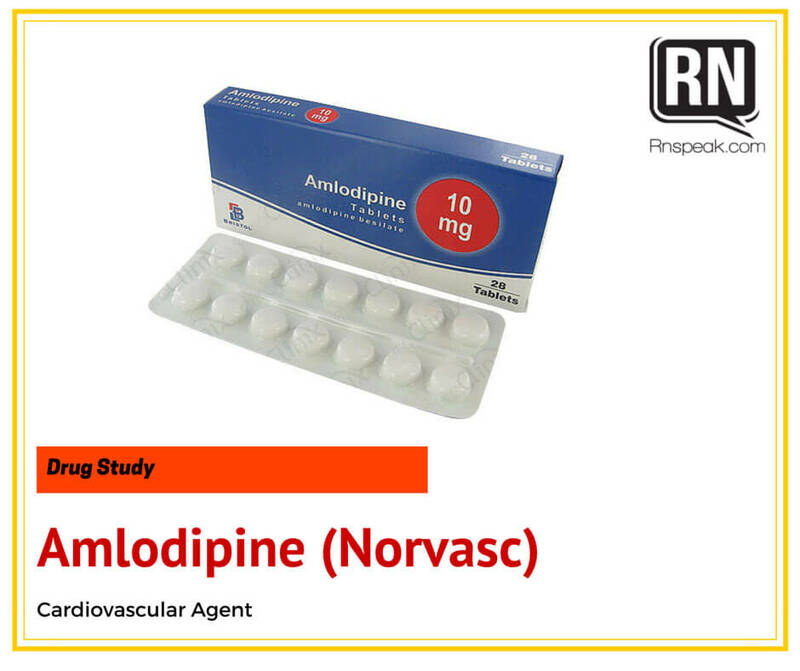 Amlodipine reduces systolic, diastolic, and mean arterial blood pressure. Treatment of mild to moderate hypertension and angina. Give drug without regard to meals. Prescribed initial dosages of 2.5 mg daily are common if added to a regimen including other antihypertensive drugs.Note: Doses are usually titrated over a period of 14 d or more rapidly if warranted. Store at 15°–30° C (59°–86° F). CV:Palpitations, flushing tachycardia, peripheral or facial edema, bradycardia, chest pain, syncope, postural hypotension. GI:Abdominal pain, nausea, anorexia, constipation, dyspepsia, dysphagia, diarrhea, flatulence, vomiting. Monitor BP for therapeutic effectiveness. BP reduction is greatest after peak levels of amlodipine are achieved 6–9 h following oral doses.Monitor for S&S of dose-related peripheral or facial edema that may not be accompanied by weight gain; rarely, severe edema may cause discontinuation of drug. Monitor BP with postural changes. Report postural hypotension. Monitor more frequently when additional antihypertensives or diuretics are added. Monitor heart rate; dose-related palpitations (more common in women) may occur. Report significant swelling of face or extremities. Take care to have support when standing & walking due to possible dose-related lightheadedness/dizziness. Report shortness of breath, palpitations, irregular heartbeat, nausea, or constipation to physician.